Download music, movies, audiobooks, series and much more legally! 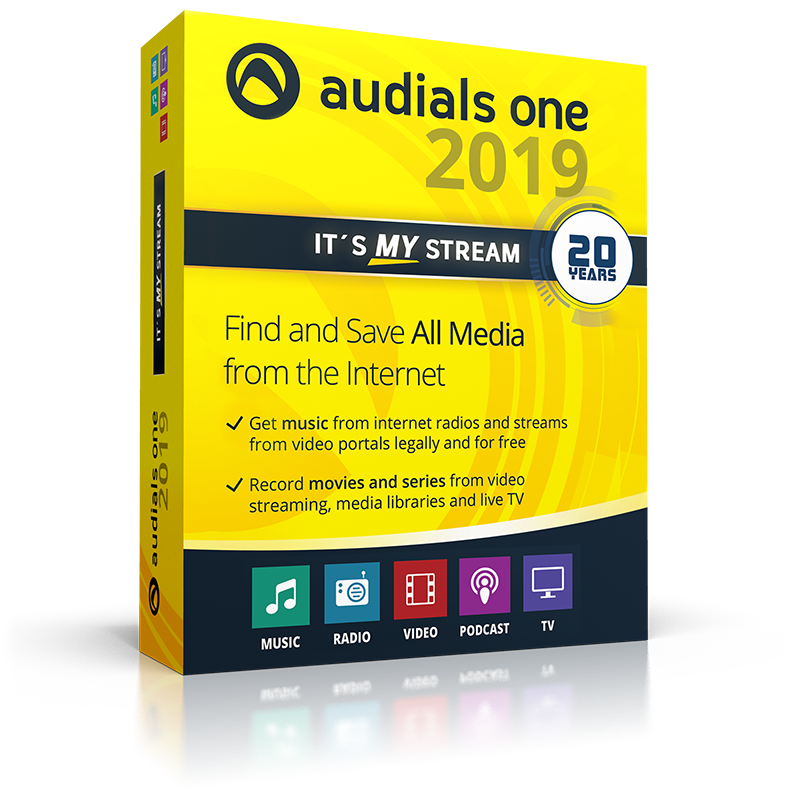 Audials One 2019 is the total solution to download movies, series, music or audiobooks from the internet fully legally. If it's available online either directly or through streaming services, Audials One 2019 will find it and download it in high quality! With its unique search engine, comfortable recording scheduler and versatile converter feature, Audials is your ticket to boundless entertainment. Whether you're using Amazon Prime, Netflix, Deezer, Spotify or any other portal, Audials One 2019 will save your favorite show to your hard disk, permanently! 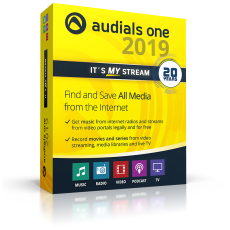 Audials One 2019 is your high-quality internet stream recorder! Recording Spotify, Deezer and other streaming providers has once again been optimized. Even at 10x their original speed, tracks are precisely cut at their start and end points with virtually no loss of quality even at high bit rates (e.g. 320 kbit/sec). And new editing features and improved suggestions make working with wishlists in Audials 2019 more fun than ever before. Try it out today! Better selection, additional services, more videos! 7 new services have been pre-configured for recording and are accessible through their respective tiles. The service selection screen has been streamlined with visual cues for currently or recently used services in your browser. Selecting perfect recording settings has never been easier! For your convenience, YouTube video links can now be queued and processed sequentially. Aside from original format and resolution, all other supported resolutions are also available. Audials One 2019 comes pre-configured for even more of the most important video streaming services but the number of specialized streaming offers keeps growing rapidly. That's why we added a new generic recording mode that allows you to record directly from your graphics card, unscaled and in high quality. This approach also works with adaptive streaming. Now, you can record any video stream in top quality! New devices require new profiles! For perfect results, the device database has been fully updated to support all current-gen smartphones, tablets, notebooks, gaming consoles and PC configurations. This ensures maximum compatibility and quality! Not only has the quality of stream recordings, e.g. for Spotify, been greatly improved but the source selection green has received a major design overhaul to make finding the perfect recording settings easier than ever before. Simply select the source and Audials will determine the best settings automatically. The software is smart and even detects whether you're using the provided software, e.g. for Spotify, or your web browser. Record live TV with a single click! Audials now comes with a highly optimized video recorder for permanent storing of streamed multimedia content. Simply hit the new record button and Audials will capture your stream in top quality. Record live TV, e.g. sports events, and stop worrying about time restrictions often imposed by online media libraries. Audials now supports 50 of the best music TV streams for a superior TV experience. More music with non-stop and fully recordable clips! The technology for recordings based directly on the contents of your graphics card memory, used in particular for Netflix, Amazon Video, Hulu or UStream, has been further improved. Support for adaptive streaming, used by these services, has also been enhanced to further minimize visual artifacts between individual sequences. This means you'll get better image quality for movies and series, especially HD content, with Audials One 2019!